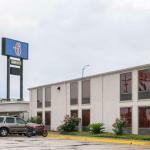 Free Wi-Fi and a convenient location make Motel 6 New Orleans a wallet-friendly choice for our guests. This pet friendly two-story hotel has 94 rooms with free Wi-Fi cable TVs hairdryers and free local calls. Non-smoking rooms are available. The hotel provides a coin laundry and meeting space. Truck and outdoor parking are free. Near I-10 the hotel is a nine-minute drive from downtown New Orleans and popular attractions like the French Quarter Jackson Square and Bourbon Street. Enjoy an exciting collection of animals at Audubon Aquarium and Zoo eight-and-a-half miles away or go five miles to try your luck at Harrah's Casino. The Mercedes-Benz Superdome is five miles away. It's 14.5 miles to Louis Armstrong New Orleans International Airport.